BEIRUT: Constituents in Beirut I, a predominantly Christian district, crowded into polling stations on Sunday to elect five candidates to join the country’s next parliament. As The Daily Star went to press Sunday night, exit polls showed the March 14 coalition winning a clean sweep in the district, with voter turnout estimated at 44 percent. 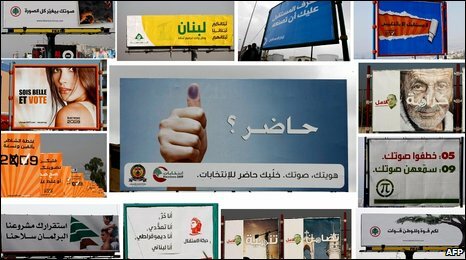 Twenty candidates, ten of whom were Independents, battled for the seats covering the areas of Achrafieh, Rmeil and Saifi. The March 14 list of Nayla Tueni (Orthodox), Serge Torsarkissian (Armenian Catholic), Jean Ogassapian (Armenian Orthodox), Michel Pharaoun (Catholic) and Nadim Gemayel (Maronite), stood against Issam Abu Jamra (Orthodox), Vreij Sabounjian (Armenian Orthodox), Gregoire Kaloust (Armenian Catholic), Nicholas Sehnaoui (Catholic) and Massoud Al-Ashkar (Maronite) of the March 8 coalition. Two of the district’s seats will go to Armenian candidates, with one each going to Orthodox, Maronite and Catholic candidates. Supporters of the Armenian Tashnag party, which is allied with March 8, took to the polls in particular force in the early morning hours, with convoys of cars bearing the party emblem and Armenian flag dropping off entire families outside polling stations. According to exit polls, 31,500 people in Beirut I voted, among them 6,700 Armenians. Hagob Norunzayan, 42, got up early to vote for the March 8 ticket. The Armenians were coming “back from all over the world just to vote,” he said, denying allegations that they received cash to vote. “We want to live in a strong Lebanon. We will win,” he added optimistically. Former US President Jimmy Carter was in Achrafieh Sunday to observe the voting. Talking to reporters at the Zahrat al-Ihsan School polling station, Carter said he hoped Lebanon’s parties and foreign supporters would accept the election results. At a number of polling stations, old men and women cast their ballots after being carried up several flights of stairs by relatives or able-bodied onlookers. The Lebanese Physical Handicapped Union sent a complaint to the Interior Ministry lamenting the difficulties disabled people faced in accessing polling stations, often situated on the second or third floors. Several March 14 and March 8 supporters interviewed at different polling stations said that they were voting to define Lebanon’s relations with the international community. “Foreign policy is the most important element of this election,” said a 31-year-old March 14 supporter who did not wished to be identified. “I believe in their foreign policy, they’re going to deal with how outside powers will deal with Lebanon,” he said of the rival coalitions. Sandy T., 21, meanwhile said Aoun’s alliance with Hizbullah had prevented further sectarian violence in the country. “If he hadn’t made the alliance, there would be big problems between the different religions,” she said. “We believe in what he and [Hizbullah leader Sayyed Hassan] Nasrallah say, and in what they can do to change Lebanon,” she added. After voting, partisans sought refuge from Sunday’s blistering heat, eating sandwiches and chocolate bars packed in special lunchboxes bearing the logos of their preferred political party. Although polling in Beirut I was largely peaceful, the Lebanese Armed Forces (LAF) broke up a fight in the early afternoon at the Ali Abi Taleb High School polling station, LBC Television reported. The high school was the only polling station for the constituency’s minority Sunni and Shiite residents. An 85-year-old male voter reportedly died of a heart attack before casting his ballot. According to OTV, four people were taken to hospital after fainting in the highly congested polling stations of the Zahret al-Ihsan and Tabaris schools. Lebanese Armed Forces troops patrolled Achrafieh’s Sassine Square and detained a number of individuals after clashes broke out over party flags Sunday evening. The observer nevertheless pointed to several violations, including several senior political figures and candidates campaigning inside the polling stations, defying a rule that they must stay at least 75 meters away from the polls. “They were going around the polling station to try to rally the troops, shaking hands,” the observer said, adding that the incident was reported to the Interior Ministry. Poor crowd control and incidences of intimidation within polling stations in Beirut I also occurred, said the observer.